These rich tones say fall to me. I stamped my background using three of the four colours in this week's palette and the forth colour for my sentiment. LOVE this CAS design Tracey, super card!! 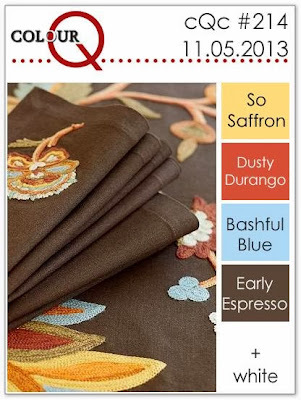 Gorgeous, rich colours and a fabulous design. Once again, you dazzle and amaze! 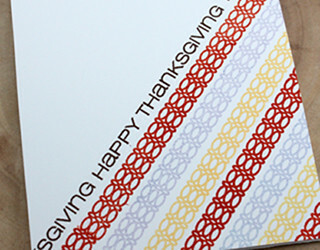 wow love this pattern and fun color combo.. great card. How do you come up with all of these great cards? I love those links stamped on an angle and I love that soft blue in the palette this week...it does remind me of Fall! Fabulous CAS card, Tracey. Love that border strip at an angle, and how you repeated the sentiment. Such a perfect job of stamping. I have this set but they never come out looking like this. I love your fun and graphic take on the colors Tracey! OMG, gorgeous! Love your design--the stamping is just stunning! So fun and so clever...really makes for a wonderful Thanksgiving card. I love how your repeated your stamped image and sentiment, fabulous! Stamped to perfection! Love the diagonal stripes, Tracey! this is great Tracey...love your choice of stamps!